How would you arrange pieces in an art gallery? Should paintings be placed in groups by artistic movement? Does it makes more sense to see everything in chronological order? Should geographic differences and temporal differences rigidly divide works? Time period, artistic movement, and geography are often used to organize a museum. Imagine how many times you’ve entered into the first room of “old” art and then walk forward in time through each successive room. 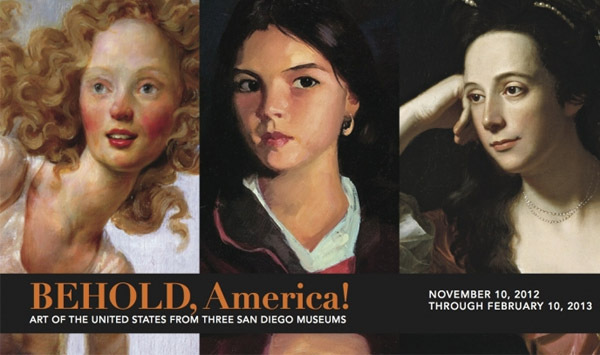 Changing this classic approach, San Diego’s three major art museums put together something a little different which I thought made for a really incredible show. They’ve combined works from their very unique collections into thematically based exhibits broadly entitled “Behold, America!” on display until Feb 12, 2013. 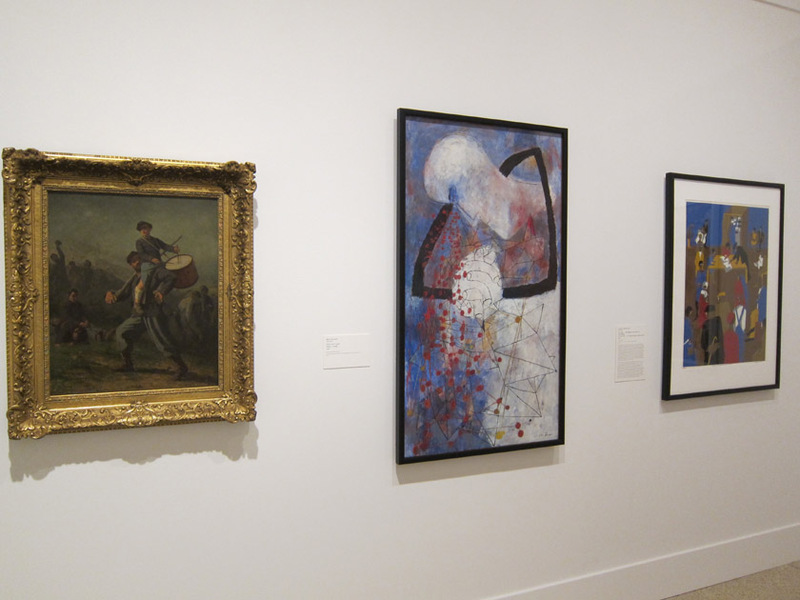 The Museum of Contemporary Art San Diego, the San Diego Museum of Art, and the Timken Museum of Art co-developed three exhibits around the central themes of Forms, Figures and Frontiers for “Behold, America!”. I was able to see Figures and part of Forms on display at the San Diego Museum of Art in Balboa Park. As someone who likes to focus on each piece but enjoys context and contrast, the juxtaposition of pieces was very powerful. With colonial puritans next to Jazz age flappers, you start to think about how broadly one must define being American and the necessary evolution of that concept. The individual is really elevated and explored within the Figures show, offering a variety of singular American identities rather than a collective one. The show also doesn’t shy away from difficult aspects of our society, addressing wealth disparity, social injustice and violence but in a way that doesn’t stop freeze the viewer. 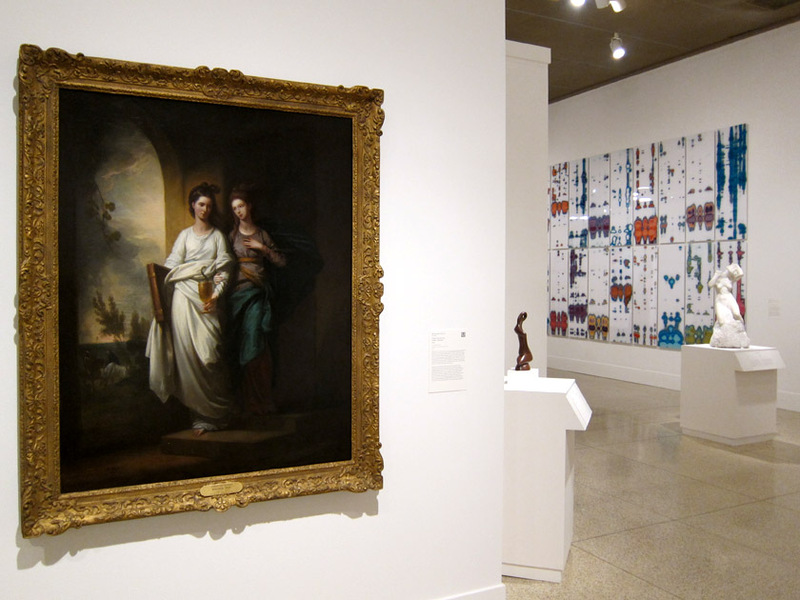 Classically clad 19th century women and a marble figure are positioned around the corner from 16 colorful panels depicting human DNA sequences. The selection of pieces was really well done. I found myself excited to turn the corner to see what else remained. I was impressed with the artistic diversity, as the show covered numerous movements and media. Given the regional wealth of Mexican and Hispanic art, it was really nice to see minority artists well represented. Struggle, reflection and progress handled differently but beautiful when shown together. It’s been a while since I’ve left an exhibit so impressed with its curators. The Figures section of Behold, America! was a lot of fun and worth a visit for anyone in San Diego. I love the concept of this exhibit and hope other smaller museums follow suit with these concept based shows. 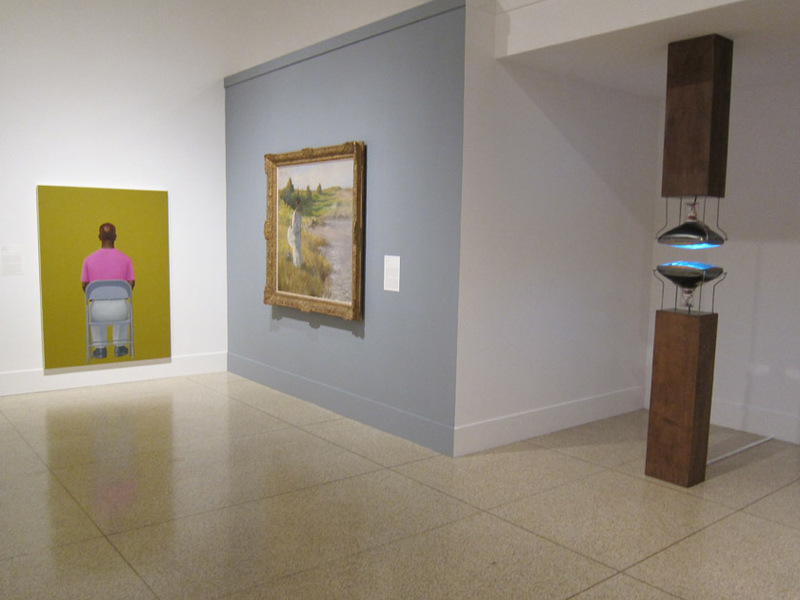 In the piece on the right, a video loop of a baby plays on the upper tube TV just inches from a TV below showing a loop of an old woman. Which is a better still life? 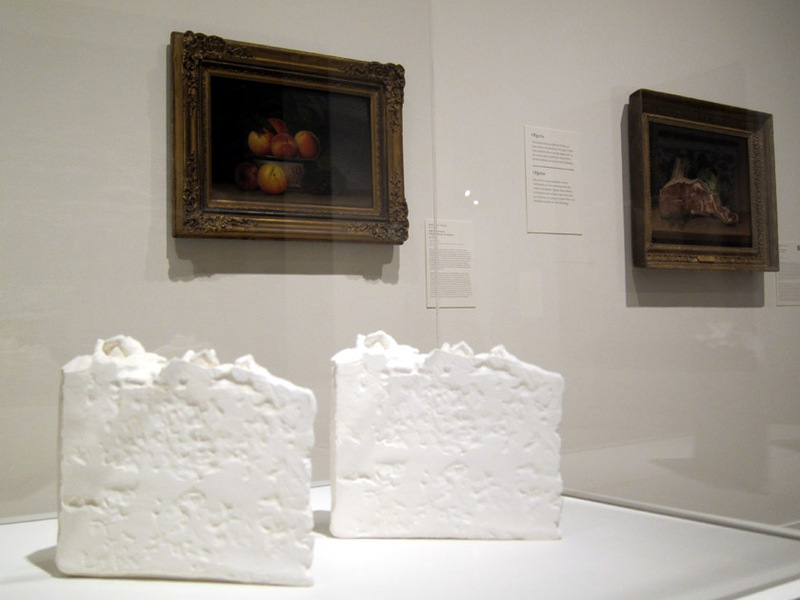 The realistically painted fruit or the white resin cake slices? Reblogged this on Art History Ramblings. This is such an interesting and unique idea for a group of museums to do – loved the article and the info. I would love to learn more about how they got the idea, and the process of collaborating like this! Agreed! Your description really shows your excitement at their different approach! Saw a thematic show here recently (15th-18th century paintings from the Uffizi), and it took me a few minutes to adjust, then I loved the organization. (Balboa Park is one of my favorite places, SDMA such a nice museum — Hope you had fun!) Thanks for highlighting this exhibition for us!